This picture was taken yesterday during one of the organized Day of the Workers peaceful protest. 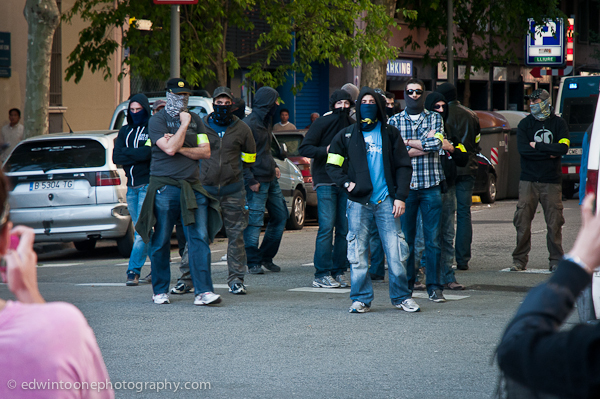 These scary looking guys are not the so called anti-system “terrorist” (as the government calls them) but the police. For the first time, as far as I know, loads of police showed up looking like this and shadowed the march. Other than wearing an armband that said police they were unidentifiable. As the protest continued many in the crowd yelled at them calling them an embarrassment among other things but the crowd remained peaceful. Finally, towards the end of the protest this group of “police” started to follow the crowd so I followed them, making sure to give them plenty of space. I snapped a few photos and one of the group turned and approached me. I, not trying to cause any trouble, addressed him politely and with respect. He ignored this and simply told me not to take any pictures. I asked if it was against the law and he said again don’t take any pictures. I asked again if it was illegal but he refused to answer. Because I was not sure of law and had seen how earlier in the day they had pushed others including journalist with press passes around I did as he asked.